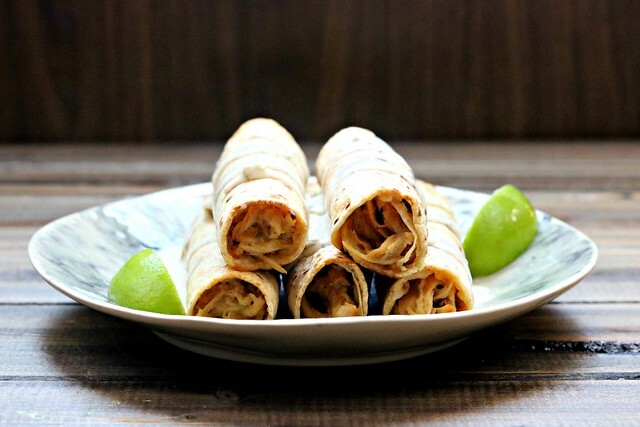 These slow cooker creamy chicken taquitos are full of creamy salsa verde chicken, rolled up in a crisp baked tortilla. Serve with some salsa verde ranch and you will have one happy dinner crowd. Oh, chicken taquitos, how I love you so. I’m not sure that I will ever get tired of eating – well, pretty much anything wrapped in a tortilla. But taquitos just have everything wrapped up in them so nicely, you just pick up, dip, and devour. What more could you ask for?? But seriously. 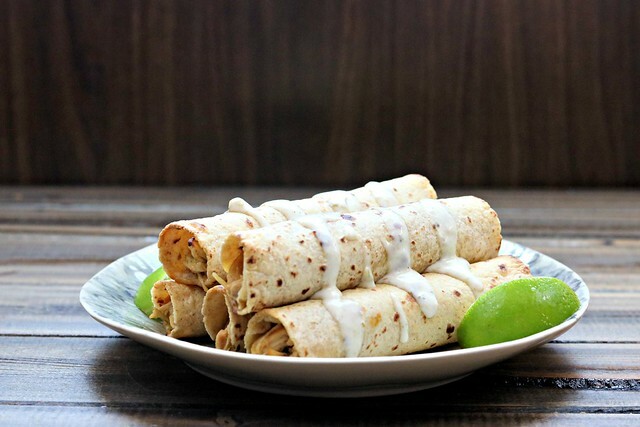 I made a version of these taquitos back in 2011, but it wasn’t a slow cooker version and when I went to remake them, that is the method I decided would work best. And, here we are. I know I may have mentioned, a time or two, how much I am loving my slow cooker this summer – but seriously, it’s the best. And before having a baby I didn’t really care about it one way or another. Now, it’s my lifesaver at least once a week. Usually on Monday, because…ugh, Monday, but this particular week it fit in just perfectly for Taco Tuesday! And because J and I have to have dipping sauce – you know, like I’ve told you 273986983947 times before – I just mixed up some salsa verde and ranch to go along with these. Easy peasy, and oh-so-delicious. Of course you could use plain ranch, buffalo ranch, chipotle ranch – or something completely ranch-free. Though I don’t know why you’d want to do that. Because, ranch is delish, y’all. However, Greek yogurt and sour cream also mix up very nicely for dips. Just sayin’. Baby girl isn’t quite to the point of eating taquitos in their finished form, but I made her some little quesadillas and cut them up into bite-size pieces, so she didn’t miss out entirely. I’m not sure if I look forward to or dread the day when she able to eat things that require dipping into a sauce or condiment. On one hand, it will likely be adorable and she’ll get to enjoy all the saucy goodness that her daddy and me do, but on the other hand…mess central. Ay yi yi. But hey, all part of being a parent, and for her, being a kid, right? It’s not fun if it’s not messy! Right? That’s what I hear, anyway. So, whether you have a family to feed, a party to throw (football season, anyone? 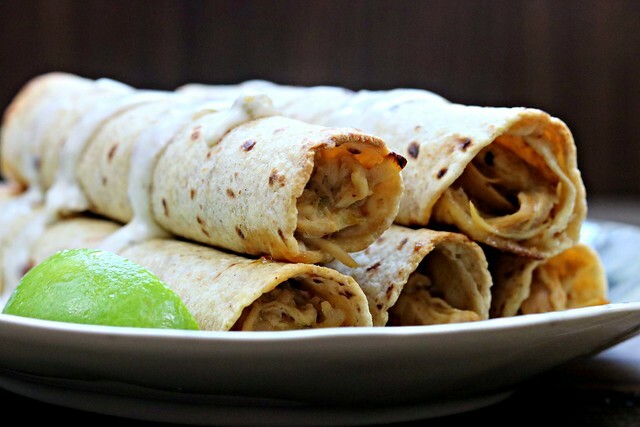 ), or you are just craving some delicious taquitos, you need to get these on the menu ASAP. Place chicken in the bottom of your slow cooker, season with salt and pepper. In a large bowl, combine the cream cheese with the salsa, lime juice, cumin, chili powder, cayenne, onion powder, garlic, cilantro, and scallions. Pour over the chicken in the slow cooker. Cover and cook on low for 4 hours, or high for 2-3 hours, or until the chicken is cooked through and easy to shred. Use two forks to shred the chicken and mix with the sauce, the stir in the shredded cheese. Keep warm. Spray the taquitos lightly with cooking spray. Bake 15-20 minutes, or until the tortillas are crisp and golden-brown. 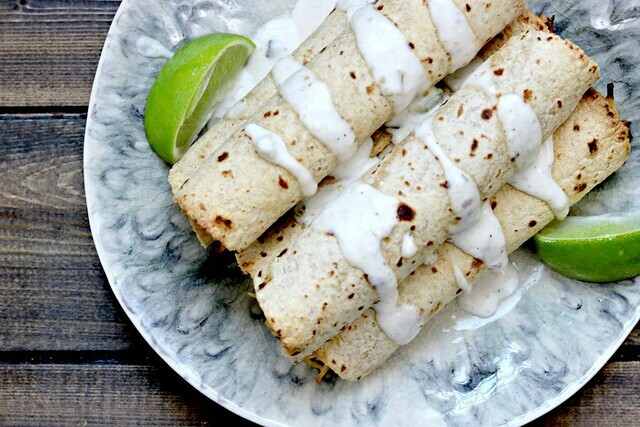 While the taquitos are baking, you can mix your salsa verde and ranch dressing together, and serve alongside the taquitos.